SPARC Selected as Host Organization for 2017 Getty Multicultural Internship! - SPARCinLA We are SPARC: Art | Community | Education | Social Justice SPARC | Social & Public Art Resource Center | Creating Sites of Public Memory Since 1976 | Founded by Judy Baca, Donna Deitch & Christina Schlesinger | SPARC is a community cultural center that creates public art as a vehicle to promote civic dialogue, foster cross-cultural understanding, and address critical social issues. We accomplish our mission by producing, preserving and presenting community-based public art. SPARC is a facilitator Ð finding ways to tell richly textured stories that help community participants and artists achieve a measure of change and transformation. 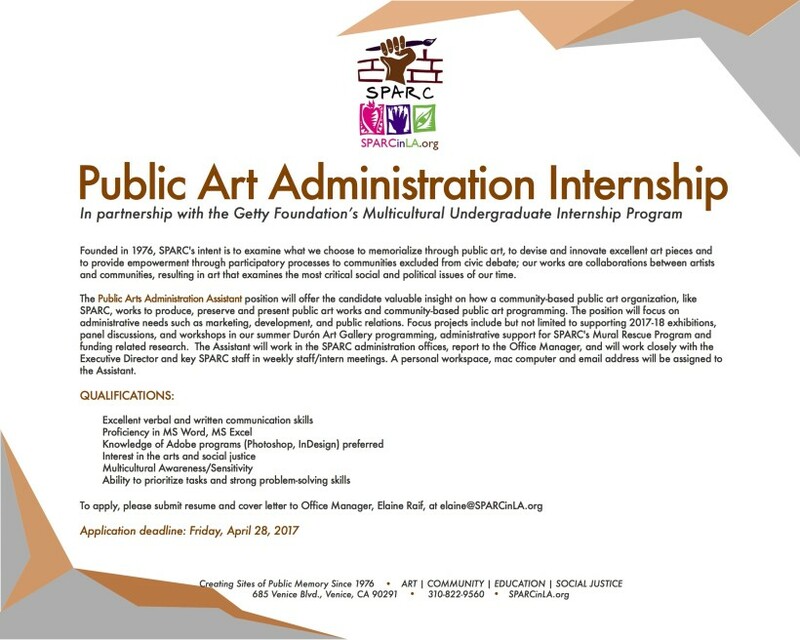 Apply to be SPARC’s next Public Art Admin Assistant this Summer through the Getty Foundation‘s Multicultural Undergraduate Internship Program! Be currently enrolled undergraduates. Students must have completed at least one semester of college by June 2017. Students graduating in May or June 2017 are also eligible. Reside or attend college in Los Angeles County; and Be a United States citizen or permanent resident. The internships are full-time (40 hours/week) positions, each with a stipend of $5,000, for a consecutive ten-week work period between June and August, 2017. APPLICATIONS DUE FRIDAY, APRIL 28, 2017!